During a time of increased tensions following the successful launch of Sputnik, then Vice President Richard Nixon took a good-will trip to Russia. What followed was a sometimes playful, sometimes pointed public exchange between Nixon and Nikita Khrushchev throughout his stay in Moscow. The exchange is known as the Kitchen Debate, for a particularly sharp exchange in front of a US model home’s display of a GE electric kitchen. Nixon furthered his domestic political ambitions with a seeming jab at Khrushchev’s chest, reaffirming his anti-communist credentials at home. 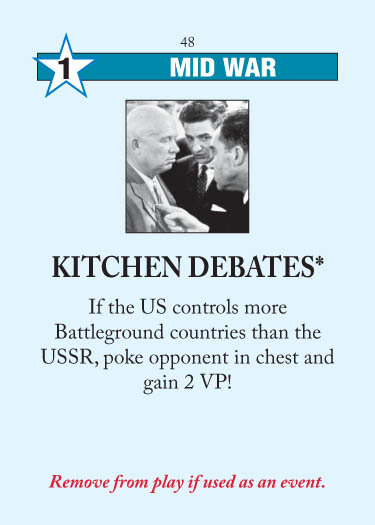 Kitchen Debates incentivizes you to take battlegrounds, but you should already be incentivized to do that anyway. There’s not much to say about this card — if the US is ahead on battlegrounds, you lose 2VP; if the US isn’t, then you don’t. I find Kitchen Debates to be more helpful as a rough barometer of how I’m doing. Start worrying if the US has more battlegrounds and is ahead on VP. Note that this card is not removed from the deck if triggered while the prerequisite is not met. 1 Op is usually not very helpful, and 2VP often is. Unless you have some immediate use for the 1 Op, I prefer the 2VPs and the opportunity to poke my opponent in the chest. This entry was posted in Mid War, US Events and tagged kitchen-debates. Bookmark the permalink. Why is the point to give 2 VP to US player if and only if this is ahead in BG-control anyway ?? Just to hurry up the “turning-tide” process from USSR ? And – if condition is met – the ideea is just to keep a 1 OP US-event in deck … to be there ?? I look at this card in very much the same way that I look at Summit (and on which I commented in a very similar manner, but only for the US in this case): that this card is about furthering a gathered momentum that the player (in this case, solely the US player) may have in the game, but is otherwise garbage. So yes, it is to “hurry up the ‘turning-tide’ process from USSR”, if the pre-req is met. Like almost all cards, it is situational, but this one is particularly “swingy”, in that it’s incredibly good to trade 1 Op to get 2 VPs, but is otherwise a pretty lousy card if you haven’t met the pre-req. And it’s unlikely that this would be a card that the US would hold until next turn in the hopes that the pre-req can be met next turn (as opposed to other fantastic US Events, or really horrifying Soviet events). And let me tell you, there is something REALLY satisfying about standing up, walking to the opposite side of the table, and poking your opponent in the chest. On the other hand, this card is a real pain if it’s in your hand as the Soviets and the US has met the requirements. I like theory’s comment about it being a barometer as to how well you’re doing as the Soviets; if you get this card and the US has met the pre-req, you’re probably not doing well. I agree with Theory and Archon. If you draw it as USSR, t’s a useful barometer, but one way or another it’s going to get played, as there are usually too many other problem cards to worry about. If you draw it as the US, 2VP are sweet (and sometimes vital if the USSR is way ahead), but if there’s a particularly good Africa BG coup, then that might be more valuable. Re: poking, there is nothing more gratifying than breaking the tension of a fraught Mid-War round than leaning over and dishing out a good hard poke. This is one reason why the online version of TS is inferior to the full game. Finally, I did not realise that if the USSR plays it and the event doesn’t trigger then the card isn’t removed (“Note that this card is not removed from the deck if triggered while the prerequisite is not met.”) Is this really true and, if so, are there other conditional cards which aren’t removed when the criteria aren’t met? >Is this really true and, if so, are there other conditional cards which aren’t removed when the criteria aren’t met? The card is indeed put into discard pile to be reshuffled in the deck if US doesn’t control more BG’s when the card is played. This applies to all events that have prerequisites (eg. NATO, Star Wars, Our Man in Tehran). It is both said in rulebook and in the cards. You only remove the asterisked cards after the event HAS occured. Are you sure about this ???? I don’t have the card in front of me to look, but I believe that the pre-req is that the US must control at least one ME country for the Event to occur. If that’s the case, then yes, it will go back in the deck if it is played for Ops by the Soviets if the US does not control any ME countries. Thanks alot for clarification ! More commonly, the USSR can use the Ops of Our Man in Tehran to break control of the only US Middle East country.